Digital Signage software for display of Templates, Images, Video, Web Pages. Setup Templates, Custom Content or Web Page URLs to display on 1 or many screens. The Content is created once and is distributed to all Screen Locations in real-time. The software is pre-loaded with 50 ready to use Templates that may be used to create an assortment of customized displays depending on your preferences. Pictures can be uploaded and they will be automatically inserted into the Templates and displayed. Product description and other information can also be entered, which will also be inserted and displayed. The software allows users to upload and display Custom Content (Images / Video / Commercial / Infomercial) that users may have got from an outside agency. 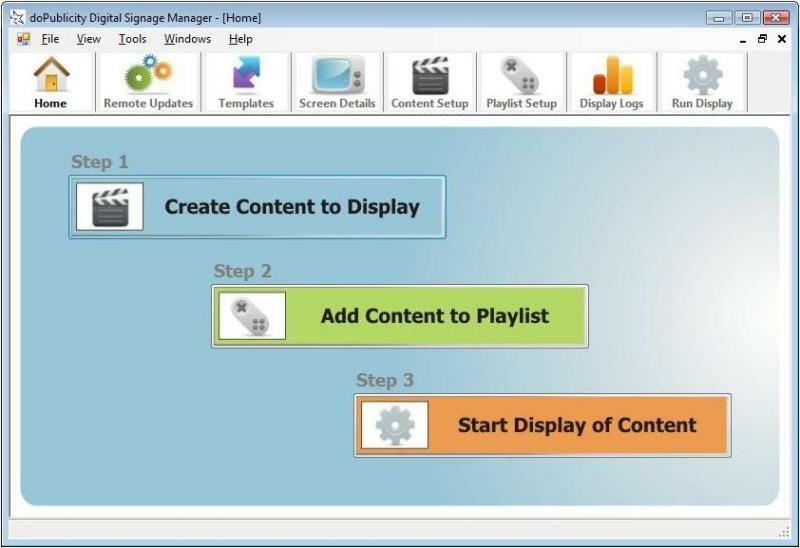 Qweas is providing links to Digital Signage Manager PRO 3.92 as a courtesy, and makes no representations regarding Digital Signage Manager PRO or any other applications or any information related thereto. Any questions, complaints or claims regarding this application Digital Signage Manager PRO 3.92 must be directed to the appropriate software vendor. You may click the publisher link of Digital Signage Manager PRO on the top of this page to get more details about the vendor.